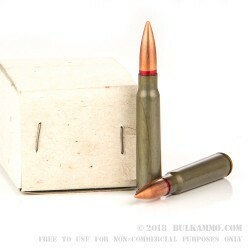 These 8mm mauser rounds are our surplus Romanian manufactured 8mm Mauser cartridges. They are Steel cased, Berdan Primed, primer pocket and case mouth lacquer coated, and come ready to use on 5 round stripper clips. These come packed in boxes of 20 rounds, or 4 stripper clips of 5 rounds each. 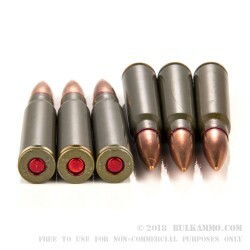 The bullets themselves are the mid-weight 150 grain Full Metal Jacket type usually seen in Romanian Surplus ammunition. These are an incredible buy and can be used for running a multitude of surplus rifle platforms such as the MG-42, Mauser 98 Rifle, and even the Yugoslavian Zastava M76 Sniper rifle. There are also newer rifles produced by multiple European manufacturers in this caliber making sure that it will be a popular cartridge for many years to come. The 7.92x57mm Mauser is also known as the 8x57 or 8mm Mauser if you're using the SAAMI Specs. The 8x57 cartridge averages at 2880 Feet Per Second with the 150 grain bullet. This round is moving extremely fast making it an ideal cartridge choice for taking deer, boar, bighorn sheep, some bear species and the hunting of other medium game animals.